In French this grain is called petit épautre and in English einkorn or little spelt, and in Italian piccolo farro or so Wikipedia tells us. Wikipedia also claims it is not good for making bread but I am currently making a 50/50 regular wheat/einkorn sourdough which rises well enough for me! It is more expensive to buy than ordinary bread flour, no doubt because the threshing is more difficult and the yields are lower and it is probably not grown in huge quantities for bread making purposes. From a value point of view it is quite a good idea to mix it with some less expensive bread flour and also you will then get a bit of lift from the gluten in the more modern flour. In the UK the easiest place to get hold of einkorn is from a store that stocks Dove Flours or online. Whatever your reasons for using alternative flours, taste and texture figure strongly in my choices. I like the softer crumb that using these older flours gives in the sourdough without having to go down the souped up high hydration porridge route of bread making which seems popular these days. I am lazy and like to work with a hydration of not much more than 68-70%. I have in the past risen to the challenge of making liquid doughs into bread, but I much prefer to be able to shape the dough easily and quickly and into a banneton and leave to rise and then bake it off without having to chill it first to get it to hold shape long enough to get it in the oven, or heat large heavy metal pots to dump it in, so the sides contain it and help it to rise, all things done successfully by younger and fitter bakers than me for the most part in their quest for soft squeezable sourdough crumbs. I like the homogeneity of the flour too. There are no big particles or flakes of bran in the flour to cut through the gluten in the dough and I don’t miss the dusty taste of bran in the bread, some people love it, some not so much. A lot of the wholegrain flour that is offered for sale here is full of large particles of bran and often I sift wholemeal flour to remove the larger bits and then try and whizz them smaller, it doesn’t work very well. I think it is the English style, dating back to that whole thing about bran being roughage and oh so good for you. I think soluble fibre is far easier on the gut and foods like butternut squash are a good source of this and other vegetable fibres rather than high bran breads which have the reverse effect on me to that which they are reputed to have! I wish they would mill and sift the wholemeal flours more finely but that is a personal thing I guess. But as I have always said, we eat the bread we like and if we can’t buy the bread we like then we need to figure out how to make something that pleases us and our tums and those who we feed too and if we can’t make it, then find a baker who makes something you like and worry not. I don’t know how it is where you live but cities like Bristol where I live have a growing and lively food culture and there are far more artisan bakers than there were ten years ago. I celebrate them all and buy a loaf or a savoury treat when I am nearby. Unfortunately I can’t embed the interactive BreadStorm formula onto this sort of a blog as it is hosted by WordPress. But you can find the interactive formula by going to this link on the BreadStorm server where I have uploaded it. And you can find out more about BreadStorm here. It suits me very well as i am a Mac user. These quantities give you approximately 3 lbs of dough or 1.75 kg in metric. Finally my rather stripped down notes to self based as is often the case on the work of Jeffrey Hamelman in Bread. The formula is also based on his sourdough and proportions. If you like a really strong sour then this is not one for you and you will need to use the proportions of starter to new flour that give you the higher levels of acidity that you desire. 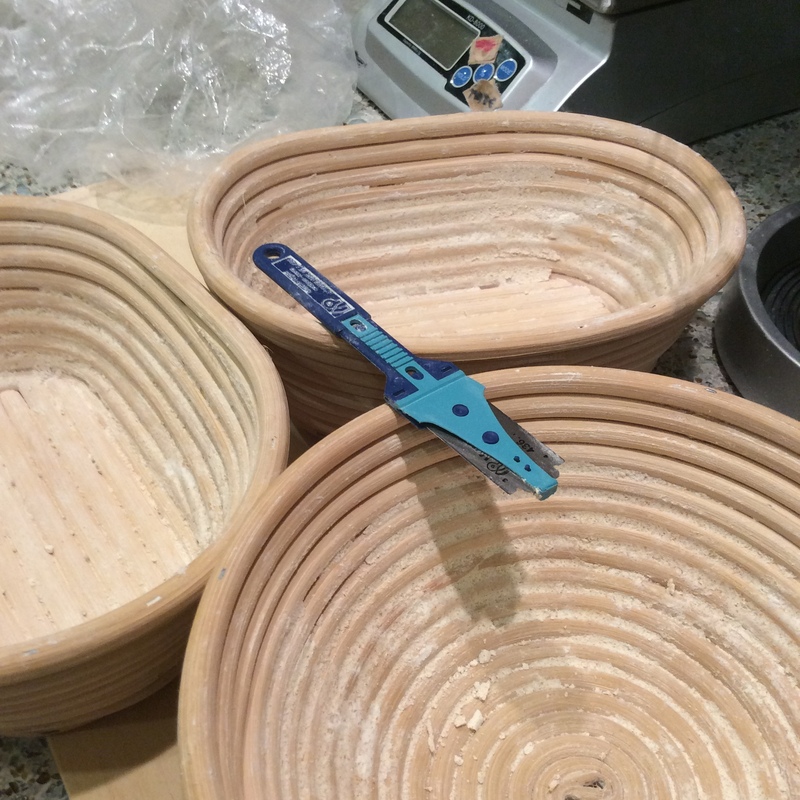 If you want more help with sourdough in general then have a look at some of my other posts or visit The Fresh Loaf or any of the wonderful bloggers who write for love of bread and are listed in the links page on my blog. I tend to make three small loaves these days, 2 x 600 and one smaller one with the leftover dough, about 500 g as they fit on my oven stone (as in the image below) and each loaf gives enough for toast and a lunch sandwich for two people. I freeze the other two and eat them over the next ten days or so. beautiful production! Hope all is going fantastic for you! 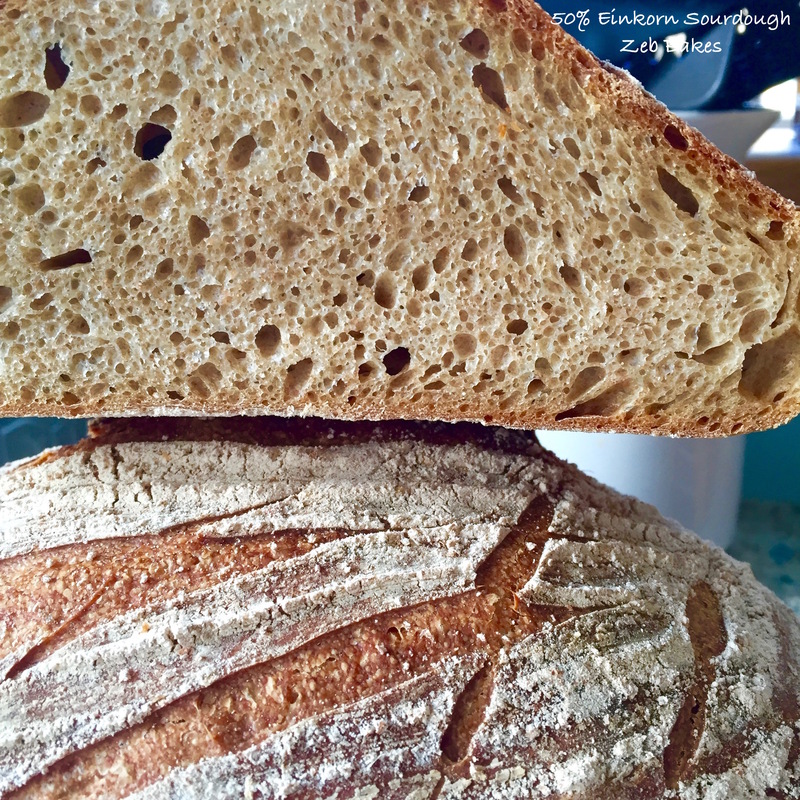 Thanks for posting this would love to attempt f I can get hold of Einkorn flour. I find it here in the wholefood stores. Do you have one of those somewhere accessible Fran? In the wars today day off took a big load of books to the Mind charity shop . As I was crossing at the lights my trolley fell over and caught me on the back of my leg! Massively bruised . That will teach me not too overload. Hope you and Brian Are well won’t be doing much walking now this week annoyed.! Hugs to you and Brian and extra big hugs to Zeb handsome and lovely Lulul. What a terrific post, Joanna! You sound so zen in your baking. I love it. Being zen is what I strive for as well these days. Your bread is beautiful with a lovely crumb. I am sharing on my FB page. I hope you don’t mind! Thank you, what a nice thing to say. I have become so slapdash in my baking, but you could say it was ‘zen’ I suppose, the path of least resistance, go with the dough, and consume the evidence :) I am delighted that you want to share it, thank you! Good afternoon Joanna. Thank you for this wonderful recipe, actually all yours post are great. Best regards. I’m glad to see your success. When we return from our travels in April I have a spelt sourdough starter that I will rehydrate and use spelt flour to try my hand at bread I can eat. I’m very excited about the prospect. Gorgeous loaves and photos Joanna. Saw Farine’s post on FB so had to come and have a look! Always keen to try new and interesting bread so am off to see if I can find some einkorn flour down under. Good luck in your quest Ann, thanks for reading! High hydrations, while I love the taste and soft crumb, the getting to that point drives me crazy, too sloppy, too messy…not enough bench space! So…I stick to a regular roll em out, plop them ratio. Gorgeous looking loaf this one. I like einkorn a lot. Here I can get it as import from Italy, or, as I do it, mail-order the whole grain and grind them myself. Your bread has a very nice crumb – I don’t believe in the mantra “the hole-yer the better”, either. Hi Karin!Thank you for your nice comment! I bet you have a good quality mill. I was so tempted a few years back to invest in one… The brand I have been using is this one Doves Einkorn Flour it says it is grown and milled in the UK. Hi Joanna – love the recipe and am about to try it – but how long do you find you need to leave the levain – overnight? A few hours…? It’s not a big problem – I’ll go with the flow – but you didn’t actually mention it n the notes! I’m also going to try using emmer flour, thought I had einkorn but duh! 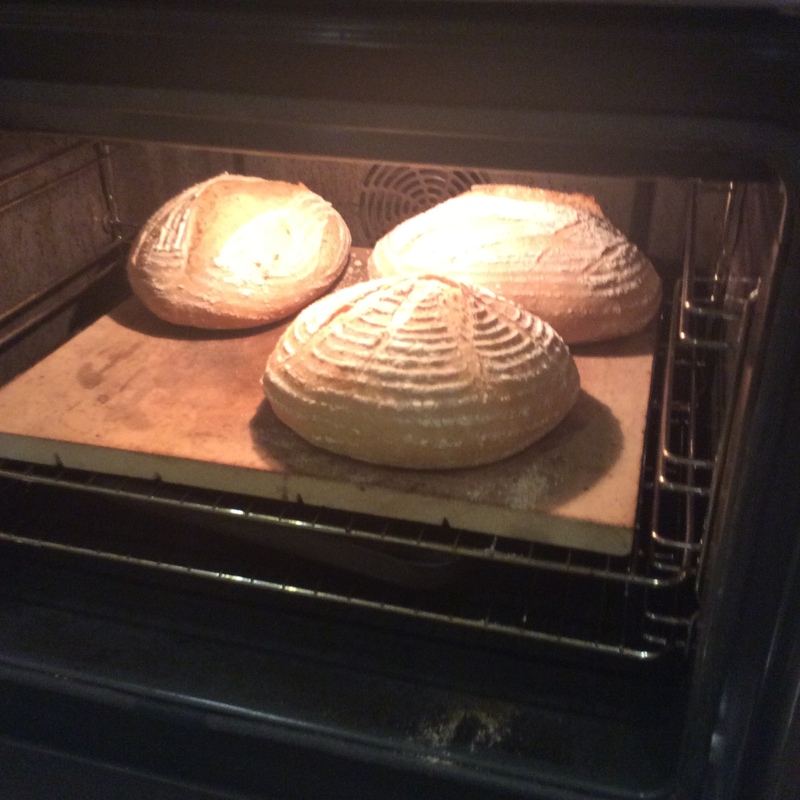 and my sourdough is raring to go…..!! Hi Carol, the levain? I usually leave it about 12 hours in the winter, sometimes longer from mixing, it really depends on two things, how active the ‘seed starter’ is, i.e. whether it has been refreshed before you start building the levain or whether it has been in the fridge for a week. And it also depends very much on the temperature of the air in the space that the levain is developing in. So if your kitchen is warm i.e. about 20C or so it will develop much quicker than in a 16C kitchen, so in the summer the levain probably is ready within 6-8 hours if it is warm. I look for a good bubbly texture, with bubbles rising to the surface, and a slightly elastic feel to it still when you pick the bowl up and swirl it round. If it has gone very frothy and sort of liquid looking it has gone a bit beyond its peak, and the resultant dough will be more acidic, but you can still use it I would say for about 18 – 20 hours after mixing and it should be fine. Emmer is good too, it is a very soft flour, if you find the bread is very close textured when you make it, then next time go for less emmer to bread flour, maybe 25%. Hope this helps x Jo PS if you look at the old Everyday sourdough post that I wrote that gives much closer attention to timing and so on. This is based on that if you see what I mean. Sorry I haven’t really been blogging much of late, this was just one of those ‘after=posts’ !